The Syrmian Front (Serbo-Croatian : Sremski front, Сремски фронт) was an Axis line of defense during World War II. It was established as part of the Eastern Front in late October 1944 in Syrmia and east Slavonia, northwest of Belgrade. The Belgrade Offensive or the Belgrade Strategic Offensive Operation was a military operation in which Belgrade was liberated from the German Wehrmacht through the joint efforts of the Soviet Red Army, Yugoslav Partisans, and the Bulgarian People's Army. Soviet forces and local militias launched separate but loosely cooperative operations that undermined German control of Belgrade and ultimately forced a retreat. Martial planning was coordinated evenly among command leaders, and the operation was largely enabled through tactical cooperation between Josip Broz Tito and Joseph Stalin that began in September 1944. These martial provisions allowed Bulgarian forces to engage in operations throughout Yugoslav territory, which furthered tactical success while increasing diplomatic friction. After the September advance through Romania and Bulgaria in October 1944, The Red Army, together with Yugoslav forces, took Belgrade (central communication node of the Balkans) in the Belgrade Offensive. Due to Yugoslav partisan activity,  the Yugoslav-Allied Operation Ratweek, and pressure from the Bulgarian Army, the Germans failed to prevent this while they awaited the redeployment of Army Group E troops from Greece. The Red Army decided to exploit this delay and continued to advance with the 3rd Ukrainian Front from Belgrade to south-west Hungary. The aim of the advance was to separate and protect their main attack in Hungary from attacks on the flank by Army Group E from the south. Launched on 1 September 1944, Operation Ratweek was a series of coordinated attacks on the Axis lines of communication, principally the railways, by Yugoslav partisans, the combined operations units of Land Forces Adriatic, the heavy bombers of the 15th Air Force and the light and medium bombers of the Balkan Air Force. Sanjaks were administrative divisions of the Ottoman Empire. Sanjak, and the variant spellings sandjak, sanjaq, and sinjaq, are English transliterations of the Turkish word sancak, meaning district,banner, or flag. Sanjaks were also called by the Arabic word for banner or flag: لواء liwa. Guerrilla warfare is a form of irregular warfare in which a small group of combatants, such as paramilitary personnel, armed civilians, or irregulars; use military tactics including ambushes, sabotage, raids, petty warfare, hit-and-run tactics, and mobility to fight a larger and less-mobile traditional military. Guerrilla groups are a type of violent non-state actor. The Dinaric Alps, also commonly Dinarides, are a mountain range in Southern and Southeastern Europe, separating the continental Balkan Peninsula from the Adriatic Sea. 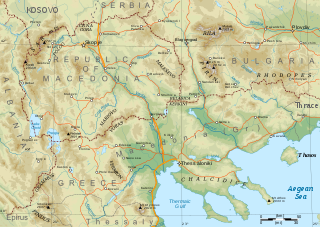 They stretch from Italy in the northwest through Slovenia, Croatia, Bosnia and Herzegovina, Serbia, Montenegro, Kosovo to Albania in the southeast. Sremski Karlovci is a town and municipality located in the South Bačka District of the autonomous province of Vojvodina, Serbia. It is situated on the bank of the river Danube, 8 kilometres from Novi Sad. According to the 2011 census results, it has a population of 8,750 inhabitants. The town has traditionally been known as the seat of the Serbian Orthodox Church in the Habsburg Monarchy, as well as political and cultural capital of Serbian Vojvodina after the May Assembly and during the Revolution in 1848. Petrovaradin is one of two city municipalities which constitute the city of Novi Sad. As of 2011, the urban area has 27,083 inhabitants, while the municipality has 33,865 people inhabitants. Lying across the river Danube from the main part of Novi Sad, it is built around the Petrovaradin Fortress, historical anchor of the modern city. Syrmia is a fertile region of the Pannonian Plain in Europe, which lies between the Danube and Sava rivers. The majority of Syrmia is located in the Srem and South Bačka districts of the Autonomous Province of Vojvodina in Serbia. A smaller area around Novi Beograd, Zemun, and Surčin belongs to the City of Belgrade. The remaining part of Syrmia is divided between multiple municipalities in Serbia and Vukovar-Srijem County in Croatia. The Srem District is one of seven administrative districts of the autonomous province of Vojvodina, Serbia. It lies in the geographical regions of Syrmia and Mačva. According to the 2011 census results, it has a population of 312,278 inhabitants. The administrative center is the city of Sremska Mitrovica. Šid is a town and municipality located in the Srem District of the autonomous province of Vojvodina, Serbia. It has a population of 14,893, while the municipality has 34,188 inhabitants. Radoslav Čelnik, known as Vojvoda Rajko, was a Serb general (vojvoda) in the army of Jovan Nenad, the titular Serbian Emperor who held present-day Vojvodina, who after the death of Jovan Nenad (1527) took part of the army from Bačka to Syrmia and acceded into Ottoman service. Radoslav then ruled over Syrmia as "Duke of Syrmia (Srem)", initially as an Ottoman vassal (1527–1530) and then as a Habsburg vassal (1530–1532), until the region was conquered by the Ottomans. His residence and capital was in Slankamen (sr). The 1st Belgrade Special Combat detachment was a special police unit which was established by the German Gestapo in the Territory of the Military Commander in Serbia during World War II. Nova Pazova is a settlement in Serbia. It is situated in the Stara Pazova municipality, in the region of Syrmia, in the autonomous province of Vojvodina. The settlement's population is currently 18,214, of which 17,421 are ethnic Serbs. Military operations in World War II in Yugoslavia began on 6 April 1941, when the Kingdom of Yugoslavia was swiftly conquered by Axis forces and partitioned between Germany, Italy, Hungary, Bulgaria and client regimes. 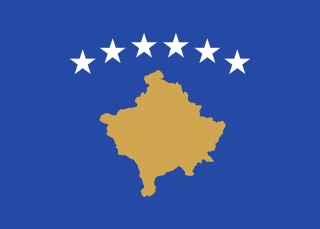 Subsequently, a guerrilla liberation war was fought against the Axis occupying forces and their locally established puppet regimes, including the fascist Independent State of Croatia and the Government of National Salvation in the German-occupied territory of Serbia, by the Communist-led republican Yugoslav Partisans. Simultaneously, a multi-side civil war was waged between the Partisans, the Serbian monarchist Chetniks, the Croatian Ustashe and Home Guard, Serbian Volunteer Corps and State Guard, as well as Slovene Home Guard troops. Konstantin "Kosta" Mušicki commanded the collaborationist Serbian Volunteer Corps during World War II. He was captured by the British Army at the end of the war, but was subsequently handed over to the Yugoslav authorities, who tried and executed him for war crimes. Vojislav Lukačević was a Serbian Chetnik commander in the Kingdom of Yugoslavia during World War II. At the outbreak of war, he held the rank of captain of the reserves in the Royal Yugoslav Army. Zaharije Ostojić was a Montenegrin Serb military officer who served as the chief of the operational, organisational and intelligence branches of the Chetnik Supreme Command led by Draža Mihailović in Yugoslavia during World War II. He was a major in the Royal Yugoslav Army Air Force prior to the Axis invasion of Yugoslavia, and was involved in the coup that deposed Prince Paul of Yugoslavia on 27 March 1941. After the coup, he escorted Prince Paul to exile in Greece, and was in Cairo at the time of the invasion in April. In September 1941, he was landed on the Italian-occupied Montenegrin coast along with a British Special Operations Executive (SOE) liaison officer and two companions. He escorted the SOE officer to the German-occupied territory of Serbia and introduced him to the Yugoslav Partisan leader Josip Broz Tito then Mihailović. Ostojić soon became Mihailović's chief of staff, and after the German attempt to capture the Chetnik leader during Operation Mihailović in December 1941, brought the Chetnik Supreme staff to Montenegro where they were re-united with Mihailović in June 1942. During the remainder of 1942, Ostojić launched a counter-attack against Ustaše troops of the Independent State of Croatia returning to the eastern Bosnian town of Foča where they were expected to continue their genocidal anti-Serb policies. As many as 2,000 local Muslims were subsequently killed in the town by forces under Ostojić's command. Ostojić later oversaw large-scale massacres of civilians and burning of Muslim villages in the border region between Montenegro and the Sandžak. Milutin Nedić was a general and Chief of the General Staff of the Royal Yugoslav Army prior to the outbreak of World War II. He was replaced in late 1938, and later commanded the 2nd Army Group during the German-led Axis invasion of Yugoslavia of April 1941 during World War II. Nedić's command consisted of General Milan Rađenković's 1st Army, responsible for the area between the Danube and the Tisza, and the 2nd Army of General Dragoslav Miljković, responsible for the border from Slatina to the Danube. Nedić had no Army Group reserve, but the 2nd Army was to constitute a reserve of one infantry division deployed south of Slavonski Brod. Rudolf Perhinek was Yugoslav military officer with the rank of Captain in the Royal Yugoslav Army who, soon after the Axis invasion of Yugoslavia, joined Chetniks of Dragoslav Mihailović. He was a member of the Supreme Command of Mihailović's Chetniks and received the rank of Major. Perhinek, also referred as Mihailović's right hand, organized Chetniks in Montenegro at the end of 1941. In period October 1941 — September 1943 he was a special envoy of Mihailovic's Chetnik staff for Montenegro who was also responsible for the intelligence service in Montenegro and Albania. Some sources describe him as an agent of Gestapo. For some time he was the Chief of Staff of Chetnik forces under command of Vojislav Lukačević. Perhinek was an ethnic Slovene. Yugoslav Government in Exile awarded him with Order of the Star of Karađorđe. Dušan Letica was a Serbian lawyer, translator, and Axis Power collaborationist during World War II. Ljubomir "Ljubo" Vuksanović was Montenegrin lawyer who was a chairman of the National Administrative Council established by Germany in October 1943 in German occupied territory of Montenegro and officially appointed on 10 November 1943. Vuksanović also held the position of the Minister of the Internal Affairs. Ratko Parežanin was Austrian, Yugoslav, British and Western German writer and journalist of Serb ethnic origin. The Central National Committee of the Kingdom of Yugoslavia known also by its Yugoslav abbreviation CNK was an advisory body of the Yugoslav Army in the Fatherland established during the WWII in August 1941 by the group of political representatives of all prewar opposition parties. ↑ 62nd Anniversary announcement Archived 7 June 2011 at the Wayback Machine , B92, 2007.